One day Rebecca's teacher found her sitting alone at lunch, looking sad and upset. She could barely bite the peanut butter sandwich that she usually couldn't wait to eat. "What's the matter, Rebecca?" the teacher asked. Later that afternoon, Jacob was standing alone by the basketball court after school. Jacob's dad asked him why he didn't go play with Marvin and Willie, who were shooting hoops. He told his dad he just didn't feel like it, so they walked home. But the truth was, Jacob and Rebecca were facing the same problem: They both felt left out, and their feelings were hurt. Rebecca was so sad that she didn't want to eat, and Jacob was so mad that when he got home he slammed his bedroom door. Children who were their friends yesterday weren't their friends today. What happened? Gangs are groups of friends, but not all groups of friends are gangs. The thing that makes a group a gang is that they leave some children out on purpose. Usually one or two popular children control who gets to be in the gang and who gets left out. Children may act much differently than they did before they were part of the gang. They may even act differently today from how they were yesterday. It can be really confusing. Everyone feels left out by friends once in a while. Friends are people just like us — they make mistakes and usually we can forgive them (after all, we make mistakes too!). Sometimes friends fight and make up again. But sometimes children form groups that they won't let other children belong to. A gang is a group of children who hang out together and won't let others join in. 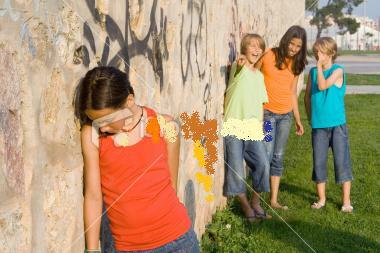 Sometimes children in the gang are mean to other children who they think are on the outside. Children might form gangs in elementary school or in middle school. Sometimes gangs are made of children who share an interest in something, like sports or computer games or music. Sometimes the children in them want to be popular or want to belong. They might say you can only join in if you wear certain clothes, or they might make you feel bad if your mom or dad can't afford the same stuff they can. Both males and females have gangs, though people who study these groups say female gangs may be more common. Female gangs are often meaner and more hurtful in the way they treat females who aren't in the group. If you are on the outside of a gang, it can make you frustrated and confused. Maybe someone who was your best friend last week was mean to you and wouldn't sit with you at lunch. It can make you feel like crying or just feel really angry or sad. You might feel lonely at lunch or after school – or even afraid if you feel that someone might pick on you or fight with you. You might be frustrated or upset because you don't know what to do. You might feel hurt because of the ways other children keep you out. Why Do Other Children Join Gangs? One of the hard things about gangs is if a person who was your friend joins one and starts treating you differently. Sometimes, the problem starts with an argument between the two of you. But other times you can find yourself on the outside of a gang even if nothing happened. Sometimes you get left out because you look, act, or dress differently from the other children, or just because you're the "new student" in class. Children who get into gangs usually want to be popular and feel cool. Sometimes children think that belonging to a gang will keep them from feeling left out. Some children feel more powerful when they're mean to other people (like bullies). Children in gangs sometimes act differently than they would outside the group. They often go along with what the others are doing, even if they know it's not right — even if it means leaving out a friend. Some children might even feel bad about the way they treat other children, but they can't figure out how to be cool and still be nice to the person who's not in the gang. This is no excuse, though. Plenty of children manage to be nice to everyone — children in and outside their closest group of friends — without being part of a gang. 1. Some children feel they should try to change themselves — and that's OK. Maybe you want to get healthy and fit or learn to smile more and be less cranky — it's great to work on yourself, but do it for you, not for anyone else. If some children are mean to you because they think you don't fit in, don't let them make decisions about the kind of boy or girl you are going to be. Decide for yourself, and then get help to reach your goals. Ask a cool cousin or friend to help you revamp your wardrobe or get a new haircut. But only change yourself if it's something you want to do. 2. If you find yourself left out of a certain group, focus on other friends. Hang out with children who aren't part of a gang. Sometimes this means finding older or younger children to hang out with, or making friends outside school. Sometimes it means being open to children who look or act differently than you do. 3. If you're on the outside of a gang and you want to be friends with someone who's in it, invite that person to do something with you. It might help if you can see your friend away from the other gang members. Maybe your mom or dad could arrange to have that friend visit at your house on the weekend. By spending time together, he or she might start realizing how silly it is not to hang out more often. But also be prepared for possible disappointment. Even if you have a great time together, your friend might still slip back into the gang when you're all back at school. 4. The most popular and well-liked children are the ones who are friendly to everyone. Do your best to let everyone feel welcome to talk to you. Look for chances to meet, talk with, and play with plenty of different children. Is someone sitting alone at lunch? Why not ask her to sit at your table? Or maybe you noticed the boy or girl standing outside the fence while you're playing basketball. It's time to invite him onto the court. Who knows — maybe the two of you will really click (which means to get along really well). Now that's a much better kind of click! 5. If your group of friends has suddenly turned into a gang, speak up. It's OK to say that you want to invite others to hang out with you, too. Be prepared for the fact that the gang might go on without you. On the other hand, others might follow your lead and stop acting so gang-y. Most schools have counselors and policies to help gangs from getting out of hand — maybe you could become an advocate or write about it in the school paper.